Aidan Conway’s study aimed to develop an approach to designing within the isolated landscapes of Mayo, Ireland. This study aimed to develop an approach to designing within the isolated landscapes of Mayo, Ireland. A commission from the local authority to design a shelter amongst the hiking trails in the county prompted the question of how to resolve the manmade object and isolated landscape. To investigate the problems of reconciliation, the conflict must first be outlined. Namely countering this extreme form of nature, the isolated landscapes of Mayo, with the pinnacle of culture and the manmade, the city. A greater understanding of both was required, research focused on the landscape and the various methods of reading and interpreting it, formation, language and memory, and perception. How the landscape came to be, how humans engage with it through language and the built form, and, how they perceive and navigate through it. Along with this came a study of the city and its fundamental elements, citing Steven Holl’s The Alphabetical City, Joseph Fenton’s Hybrid Buildings, etc. Here quite literally the formal building blocks of the city and the manmade can be established. This resulted in the extremely disparate scales of landscape and object. 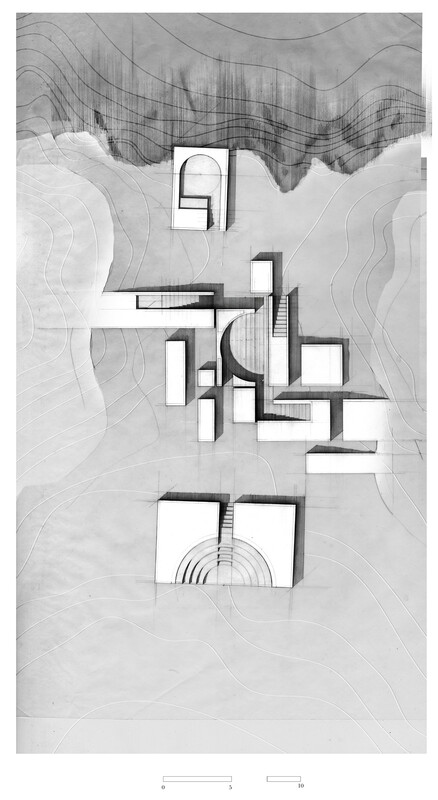 Peter Eisenman’s dissertation The Formal Basis of Modern Architecture describes the initial processes of design as a tension between the utilitarian and symbolic functions of a building. The play and negotiation between the two eventually resulting in the final form. The study of each site implies or demands a utilitarian function, while the symbolic is inspired by Jørn Utzon’s 1962 essay Platforms and Plateaus. Utzon describes the revelatory power of Aztec pyramids to invert their user’s perception of their dense rainforest environment, the canopy becomes a carpet, the sky is opened. This revelatory moment, which finds resonance in the aforementioned study of landscape perception, provides a symbolic function and also the moment where city and landscape meet. The individual is removed from the landscape by inserting them in an urban manmade moment, where the landscape is denied and their understanding of both is questioned, before the moment passes and the landscape is reintroduced. This urban moment is composed of the formal reductions analysed in the study of the city, arranged to obscure the landscape in this moment, in turn reacting formally to the landscape itself. The utilitarian function of each intervention is forced to perform formally as both a haphazard simple volume in the landscape and within the urban scenario which had been posed. Through treading this line it seeks to unify both. Thats a pretty tough question, I’d be struggling to narrow either projects of designers down to a few, I suppose most recently I’ve been looking into Dom Hans van der Laan more and more. I recently visited the Kiscelli Museum in Budapest and they had really beautiful former cathedral space they are using for exhibitions. Right now I’m back in the west of Ireland working part time in and office and then spending the rest of my time on a few of my own projects we’ll see where that goes.